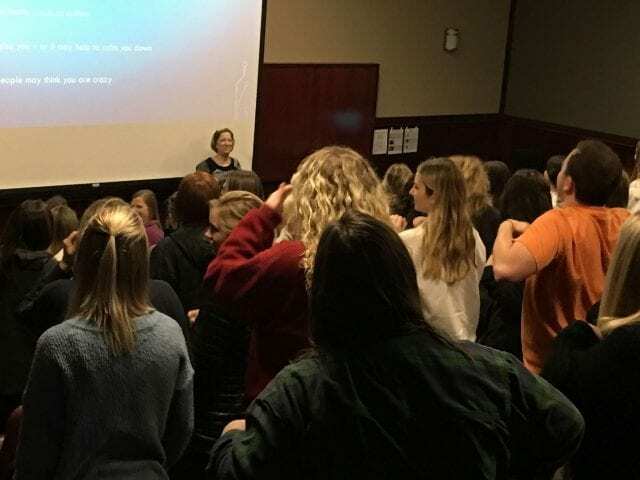 The Eleanor Mann School of Nursing offered new students a half day of advice and encouragement in an orientation session to open spring classes. Convening the morning of Jan. 11, 2019, in the auditorium of the Agricultural, Food, and Life Sciences Building on the west side of the University of Arkansas campus in Fayetteville, students heard from top faculty the Friday before spring semester began. Director of the school Susan Patton, Ph.D., gave the welcome then discussed “Locating Yourself” as well as reviewing resources that are available. Garrett in a separate session later that morning spoke on effective reading for comprehension, emphasizing reflection and retrieval of information. EMSON instructor Jane Hentzen introduced aspects of mindfulness to help fight stress, meet challenges and promote learning. She reviewed mindfulness techniques and led a mindfulness exercise. Other faculty members assisting in the program were assistant director for undergraduate education and clinical assistant professor Lori Murray, D.N.P., and assistant director for undergraduate education and and program clinical coordinator Chris Young.